release during Fashion Night Out. 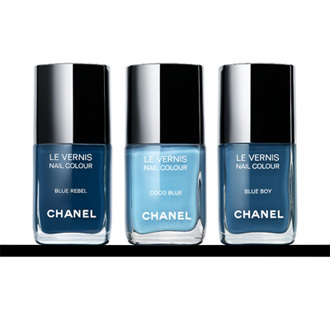 The collection includes shades (from left to right above) named Blue Rebel, Coco Blue and Blue Boy and are the creation of Chanel's Creative Director of Makeup, Peter Philips. I visited Macy's last weekend and had fun putting Peridot, Graphite, and Quartz on my nails though I think it will be harder to get my hands on this set as it will surely sell out. You can grab your own at your local Chanel store/counter or on Chanel.com starting September 8th. Don't dilly dally though, any bottles left will not be sold after the end of the month.